Oxford University Press, USA, 9780195171020, 174pp. Pangu, a god asleep inside a giant black egg for 18,000 years, wakes up to create the world. Liu Bang, the founder of a Chinese dynasty, begins his life as a peasant. Sun Tzu, a fearless war strategist, writes one of the most popular books of all time. These are just a few of the captivating figures you'll meet in The Ancient Chinese World. 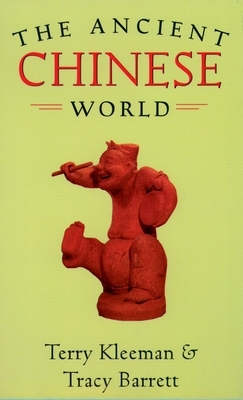 Terry Kleeman and Tracy Barrett use a rich variety of intriguing primary sources-turtle shells, clay pots, an ancient wall, folk songs, poetry, and more-to construct a lively history of the politicians, farmers, warriors, and philosophers who created and shaped the ancient Chinese world. They also show us the fascinating process of constructing the historical jigsaw puzzle. Archaeologists discover a 400,000-year-old skull near modern-day Beijing and determine that it is one of our earliest human ancestors. A scholar who is prescribed "dragon bones" to cure an illness realizes that the bones-which are actually turtle shells-contain ancient Chinese writing used to send messages to the gods. The fantastic discovery of Lady Hao's tomb reveals that in ancient China a powerful woman led soldiers into battle. The letters exchanged by two military leaders show not only how the Chinese invented the sword, but also how they used the kite as a military weapon. Using these ancient artifacts and writings, Kleeman and Barrett weave the dramatic story of rulers, writers, soldiers, and citizens who made up the fascinating and unique world of ancient China. Terry Kleeman is associate professor of Chinese and religious studies at the University of Colorado at Boulder. He is the author of A God's Own Tale: The Book of Transformations of Wenchang the Divine Lord of Zitong (SUNY, 1994) and Great Perfection: Religion and Ethnicity in a Chinese Millennial Kingdom (U Hawaii, 1998). He has served since 2002 as president of the Society for the Study of Chinese Religions and is managing editor of Studies in Central and East Asian Religions (E. J. Brill). Tracy Barrett is the author of numerous books for young readers, including the award-winning Anna of Byzantium (Laureleaf, 2000) and Cold in Summer (Henry Holt, 2003). She teaches courses on writing for children and on children's literature and is on the faculty of Vanderbilt University in Nashville, Tennessee.